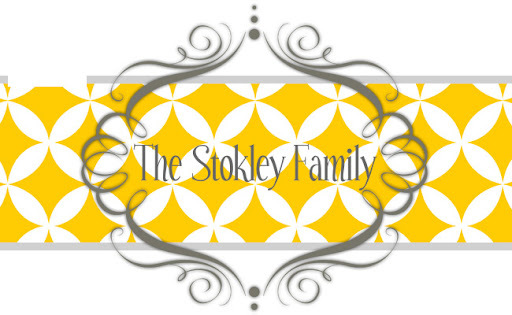 The Stokley Family: Oh, How we love these girls! Oh, How we love these girls! Have you ever seen a better looking group of girls?? These are hands down without a doubt my favorite group of women, ever. Is there really anything better in life than a good, close family? I can answer that for you, no there is not. There is nothing better than knowing no matter what you have someone to support you and love you. I know we always make jokes about how goofy are family is, how big our family is and how we get together for EVERY SINGLE BIRTHDAY, but I am so thankful we do. I'm thankful that Ryleigh and Tanner will grow up in a family that loves them and a group of people who would do anything for them. My mom is by far my best friend. She is always there to help us do whatever we need her to. She loves Ryleigh and Tanner so much (probably more than she loves me!) She is the bossy one of the bunch and the first to be a grandma. Although in my mind I think of all of them as an extension of grandparents for the kids. She is a wonderful cook, Ryleigh said just the other day that Mi Mi's cooking is so yummy and mine was Yuck-O! Aunt Tena, we don't see her nearly enough! She has always been hilarious and so much fun to be around. Ryleigh and Tanner love her and she's always going to make you laugh! She is a giver my nature and is always putting everyone else above herself. Nana is our prayer warrior! She literally prays for hours every day and sometimes when I have something big going on I actually call her and ask to her to devote her entire prayer time to me. (which I doubt she really does.) No, I'm not selfish! :) Chances are if you read this blog then she prays for you, on a daily basis. What better gift could you give your family than the gift of prayer? Aunt Lisa is who the kids probably see the most since she lives right next door. It's funny how in the winter we will go a whole week without seeing them but once daylight savings comes around we see them a few times a week. Ryleigh and Tanner love going over there and playing and destroying her house. Who else would let you eat 3 pixie sticks out of a medicine cup with a mini spoon! She has recently been spotted stealing our blackberries as Ryleigh and Tanner informed me! Aunt Velvet according to Ryleigh and Tanner makes the best cookies! I guess when you are 3 & 4 anyone who lets you eat cookie dough straight out of the container is going to be a great cook! She has always been willing to keep the kids whenever I ask and is actually keeping them tonight for me! She is the baby of the bunch so she is also the closest to my age. Whitney and I give her such a hard time but I hope she knows how much we love her! Aunt Cheryl has been God sent this past year! She has been so helpful with Ryleigh and school. She lets me bring her there every morning before work and Mrs. Kim or Aunt Cheryl will walk her over to school. Is has saved me more stress and worry than they could ever imagine! Ryleigh has really enjoyed going to Curves and loves getting to see everyone there. Aunt Cheryl is the sale queen and is always looking for stuff for everyone. She can see something that is such a good deal and she'll buy it, it's bound to fit someone in our family! So to answer my first question...No, I've never seen a better group of girls in my life! We are so thankful for them and everything they do for our family!! I love the second picture of them! Whitney and I had been posing all day and told them to do the same! I agree....you will never meet a better bunch of ladies! You are very lucky Tiffany to have such a loving caring family.